I’m a frontend web developer. My job is to turn a web designer’s creative layouts and mockups into working HTML & CSS webpages to the best of my ability. This is the story of how I ended up uploading a fictional criminal to the homepage of a client website without even knowing! The website I’m talking about has been changed since, so there’s no point showing you a link. Not that it was changed because of my actions – don’t worry, it’s not like I put a photo of Charles Manson or Harold Shipman on an innocent corporate website! So let me start at the beginning. The client wanted a header image for their website, and wanted it full of happy smiling faces – something which (if done well) always gives a website a welcoming, positive feel. The client wasn’t able to provide any staff photos unfortunately, so I searched for some business people on the iStock photo library. If you spend a long time searching iStock, like I do, you might notice the same faces cropping up time and again. Sometimes they’re just in different poses, or dressed a little different. I guess that’s normal, after all, if you’re a professional model you’re going to have a lot of photos taken. So I found a photo of a jolly plump man with a white beard. I’d actually seen the same man before and even used a different photograph of him in a presentation I’d once created for a construction company. So I recognised him. The photo I found had him in a casual blue shirt smiling at the camera, perfect! So I used the photo, along with several others and showed the client. They were happy and the website went live. About a year later, I’m watching one of my favourite TV shows, Dexter. It’s about a guy who works for the Miami Homicide. 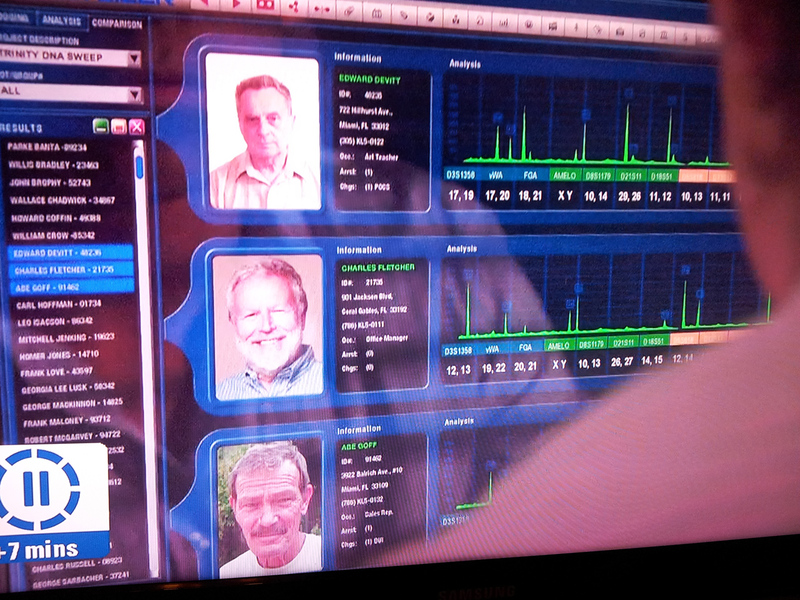 So in this episode I watched, Dexter is searching through the Miami police database of criminals, trying to match them with some evidence. As he scrolls through all the entries of criminals, who did I see as one of the faces? It was the jolly white-bearded man I used on the website! It wasn’t just the same guy; it was exactly the same image with him smiling at the camera wearing his blue shirt. In the TV world of Dexter, jolly bearded man is a criminal, or at least has a criminal record with the police. There’s no great mystery here; obviously the TV crew had searched for royalty free imagery the same as me, and bought the exact same image. But the point is it’s very easy for the same images to be used by different people for VERY different purposes!. I’ve witnessed this plenty of other times too. There’s one guy for instance (he must be a hard working model!) who I’ve seen used on publicity materialin shops, on websites, on billboards, and even in a shopping centre in a different country. The jolly bearded man in Dexter was only shown for a fraction of a second. But what if it had been more obvious? What if they had shown a full screen close-up of the guy and made it obvious he was the worst kind of murderer imaginable? Imagine viewers of that episode then jumping on the internet and seeing the same guy on your company website? Weird. Here’s the original photo of jolly bearded man. Here’s a photo I took of the image on the TV series Dexter. So pick your stock photography carefully I think it’s always better to use photographs of your own people wherever possible anyway – whether that’s staff, customers or suppliers – because it’s much more authentic. But if you do need to rely on stock photography for images of people, my advice would be to avoid any that look very familiar! Maybe you’ve spotted some stock photography regulars too? We’ve written a list of the top offenders here! lol… but the most important question is – did the ranking drop in serp?